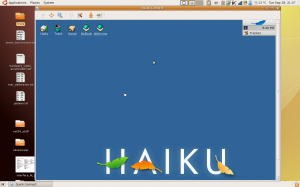 I read on OSnews about the alpha release of Haiku. It’s been several years since I installed BeOS the last time so I decided to try Haiku. I first tried it on virtualbox but I didn’t get the networking to work flawlessly so I decided to install it on libvirt. I expected quite a hassle but it was done in a whissle. I first tried the rtl8139 interface but that isn’t supported by Haiku :s A list of possible interfaces can be found on the libvirt website.